When they decided to build the Chunnel, the British and the French invited bids from reputed construction companies. While most of them quoted astronomical amounts for the job, two Sardarjis/Mallus/Biharis/Poles (take your pick) put a bid of $1000. Members of the Channel Tunnel Group called the two of them and asked for an explanation. “I will dig from England and my brother from France”, one of them explained. “We meet at the center and the tunnel is complete”, the other completed. “What if you don’t meet”, asked a naïve European. The two entrepreneurs had thought about that. They looked at each other, smiled and replied. Hezekiah’s Tunnel, the longest tunnel built till the time without any intermediate shafts, was dug underneath Jerusalem in 701 BCE. 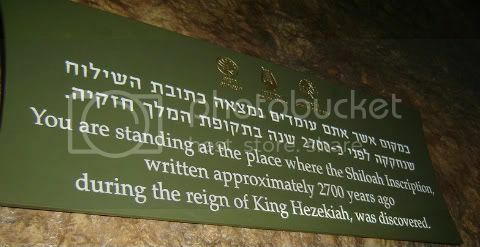 This 1700 feet tunnel mentioned in the Bible was built during the reign of Hezekiah. From the Siloam inscription found on wall, we know that the tunnel was dug by two teams from opposite ends. The question is: how did they meet underneath? Why didn’t they create two tunnels? This tunnel is not in a straight line. While a straight line would have produced a tunnel of 1050 feet, the architects took a convoluted route which added 700 extra feet. Still they managed to accurately meet and complete. While many theories were proposed, including one which suggested that the tunnel diggers expanded a natural tunnel, they were all proved wrong. The latest issue of Biblical Archaeology Review has the answer. For a moment, I was like where was the post going? Anyways, great narration, though short.